Adult Age Differences in Activity Memory: Cue and Strategy Utilization (M.P. Norris and R.L. West). The Assessment of Qualitative Age Differences in Discourse Processing (E.A.L. Stine and A. Wingfield). Aging and Schematic Influences on Memory (T.M. Hess). Metamemory in Adulthood: Differentiating Knowledge, Belief, and Behavior (C. Hertzog, R.A. Dixon and D.F. Hultsch). Cognition and Aging: A Theory of New Learning and the Use of Old Connections (D.G. MacKay and D.M. Burke). Semantic-Memory Function and Dysfunction in Alzheimer's Disease (R.D. Nebes). A Developmental Approach to the Study of Visual Cognition in the Elderly (M.J. Sharps). Expertise and Aging: Life in the Lab (N. Charness and E.A. Bosman). Levels of Knowledge Utilization and Visual Information Processing (W.J. Hoyer). 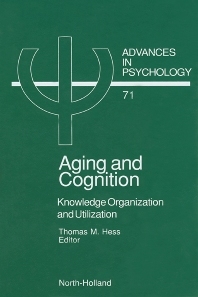 Aging and Everyday Cognitive Abilities (S.W. Cornelius). Affect, Control, and Real World Problem Solving across the Adult Lifespan (F. Blanchard-Fields and C.J. Camp). Author Index. Subject Index.